This intro class will give you some tools to communicate with the animals in a different way. Would you like to have more ease understanding your pet? Would you like to know what you are communicating to your pet without being aware of it? Are you having trouble with your furry house mate? This intro class will give you some tools to communicate with the animals in a different way. Whether you are already communicating with your animal, or if you are a total beginner, the Access Consciousness tools will assist in giving you a deeper level. From the Faciitator Series in Mooloolaba, Austrailia. Suzy Godsey travels the world facilitating people and their animals to have more connection and understanding. She is sought out for her remarkable talent to assist animals of all kinds including: dogs, cats, horses and non-domestic wildlife. 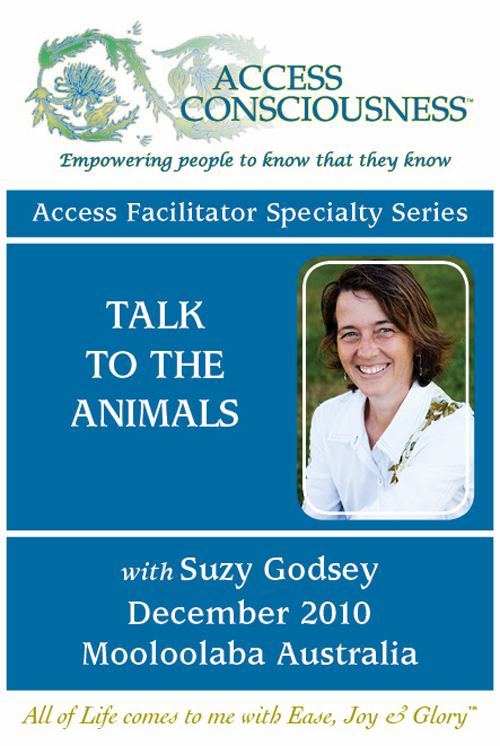 Suzy is a certified Access Consciousness® facilitator and uses the tools of Access to create dynamic change and communication for people and animals.